There are some cheap cars out there on the new car market, but what’s the cheapest one a family can get away with as its only car? Auto Trader’s Road Test Editor Ivan Aistrop reckons that honour falls to the Dacia Logan MCV. Over the next six months, he’ll see if he’s right. 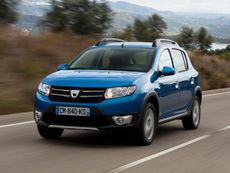 The Dacia Duster is a mid-size SUV you can pick up for the same price as a low-end city car. That means it has an immensely diverse set of rivals. In some ways it competes with a Nissan Qashqai, but in others, it competes with a Hyundai i10 or a used Ford Focus. This week, Rachael, Erin and Vicki (REV… get it?) are testing three popular budget SUVs – Suzuki Vitara S, Dacia Duster, and Jeep Renegade – based on how people search for them at Auto Trader. Find out why Dacia is the 2018 winner of our Best Value Brand award. Like the regular Logan MCV it’s based on, the Stepway provides loads of interior space for a very affordable pricetag, but it does so with a little more style than its sister car, thanks to an SUV-style makeover. With sales of SUVs booming, we take a look at the latest cars revealed at the 2017 Frankfurt Motor Show. More than a million Dusters have been sold around the world since the first version went on sale seven years ago, and the latest model will break cover in two weeks’ time. The Dacia Logan MCV Stepway gets a more rugged, crossover-esque look than the standard Logan. Looking for a big estate car for supermini money? The Logan MCV is pretty much the only show in town. The Stepway is a chunky looking nuclear-family-sized crossover that’s available for supermini money. It’s not the most accomplished of motors, but it’s undeniably great value for money. The Sandero is a family sized hatchback that’s based on proven Renault mechanical components. It’s not the most cultured of motors, but it scores an A+ for affordability. The Sandero gets a mild mid-life refresh, but sticks doggedly to its tried and tested recipe of family hatchback motoring for sub-city car money. Whether you’re after a stylish city car or something a little more spacious, the cost of insurance shouldn’t stop you from getting what you want.